Sometimes the simplest things cause problems for people, even those of us who have been working with computers for a long time. When Really Simple Syndication (RSS) first came out, it took me a while to figure out that I could subscribe to news stories or other items of interest online by clicking a link. Because Outlook was behind the technology curve, it took even longer for me to find, install, and learn how to use a third party RSS feed reader add-on. 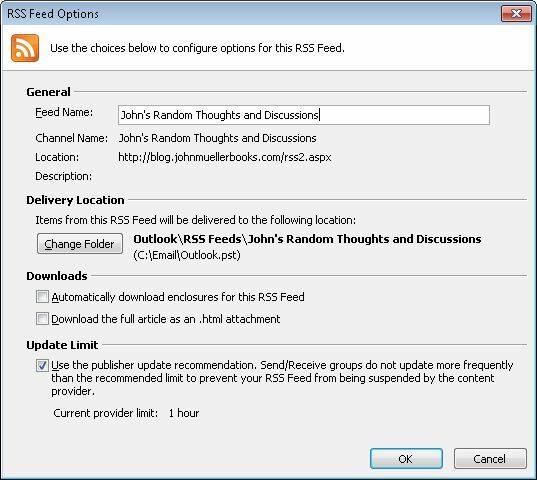 The feed reader makes it possible for Outlook to receive and use RSS posts (something that Outlook 2010 provides by default). Once I understood how RSS worked, it seemed so simple, but getting to the point of actually using RSS was daunting in a way because it was something new. That’s one reason why I think this post is important. I imagine that there are many people out there who are just like I was—they don’t understand that RSS makes it possible to read this blog every day by having it automatically delivered to their e-mail application’s inbox or to their browser. So, just how do you subscribe to my blog? Look at the left side of my blog and you’ll see a category called Syndicate as shown here. Within this category you see links for subscribing to my posts, comments people make about my posts, and any podcasts I upload. Clicking these links subscribes you to various portions of my blog using either Atom or RSS. Atom is simply an alternative to RSS, but both technologies work essentially the same way. You click the link, your feed reader receives a request to make a new subscription, and then you subscribe to the content. Once subscribed, you receive updates about content on the site automatically through the feed reader. Feed readers are normally part of a browser or e-mail application. In order to choose the right link, you need to know what sort of post notifications your feed reader supports. The help that comes with the application should provide the information you need. In addition, you need to decide whether you want to see posts, comments, or both. I don’t currently provide podcasts, so even though there is an option for them, you won’t receive any notifications at this point. What happens after you click a link depends on which feed reader you’re using. For example, I use Outlook 2010 as my feed reader. When I click on an RSS link, I see a copy of Outlook 2010 open and a dialog box telling me about the feed like this one. When I click Yes, Outlook adds a subscription to the RSS feed for me. Every time I check for updates from that point on, I also receive any RSS feeds that I’ve subscribed to and can read the posts they contain. In my case, the RSS feeds appear in a site-specific subfolder of the RSS Feeds folder in Outlook. It really is that simple. Many RSS feed readers support additional features. For example, clicking Advanced displays other information about the feed in Outlook as shown here. I can use the options on this dialog box to tell Outlook to download articles, rather than just headers. I can also automatically download any enclosures supplied with the post, such as source code. The point is that you can use your RSS feed reader settings to modify how your system works with RSS. Downloading complete articles makes sense only when you intend to read entire articles most of the time—headings make more sense when working with sites that you read some of the time. This is a brief introduction to RSS that should make it easier for you to subscribe to my blog and enjoy it on a daily basis. Please let me know if you have any questions about subscribing or if you encounter any difficulties at John@JohnMuellerBooks.com.